To see how long has the Windows 8.1 or Window 10 Computer been running, the solution is simple, or to see last restart time or Install-Date! 1.) ... Find out the Operating time via Windows 8.1 Task Manager. 2.) ... Server statistics using the NET command in the command prompt. 3.) ... System start time and Install-Date via Windows 8.1 System Info. The Solution 2 & 3 is also for Windows 7 and Server! 1.) 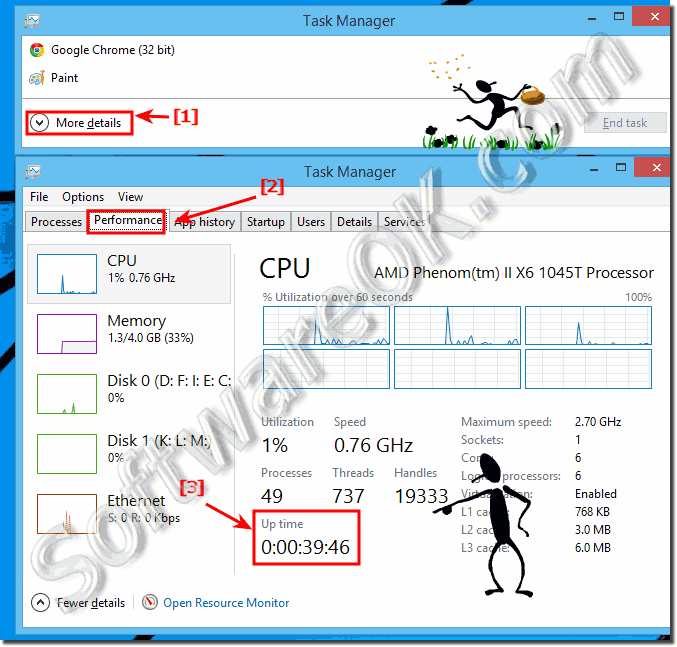 Find out the Operating time via Windows 8.1 Task Manager. (Image-1) the Operating time via Windows 8.1 Task Manager! 2.) 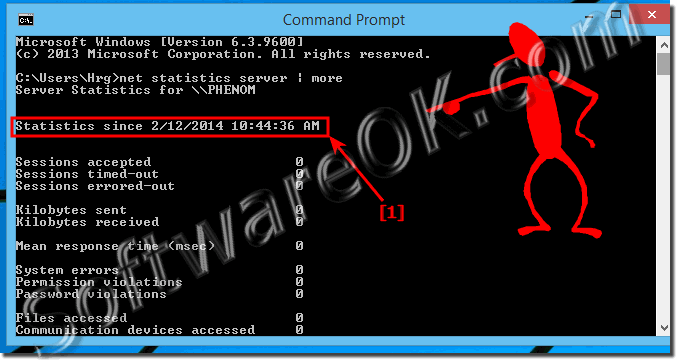 Server statistics using the NET command in the command prompt. (Image-1) Statistics using the NET in Windows 8.1! 3.) System start time in the Windows 8.1 System Info. Start the Windows 8.1 command prompt, eg [Windows logo key + X] and enter the SystemInfo command! (Image-1) System start (boot) time, Install-Date Windows! How long is my computer running? How can i tell how long my windows server 2012 has been up? Check time server 2012 has been running? When has my computer been disconected? How long windows 10 computer has been on? Check to see how long windows 10 has been booted? How long has my Windows 8 system been up and running? Find out how long Windows 8.1 has been running? Find how Long my Win 8.1 Computer Has Been Up and Running? How to Check How Long my Windows Computer Has Been Up & Running? Windows 8 has been around for how long? W 8.1 running time, how long the pc is on? How long has windows 8 been out or how long wins 8.1 has been running? 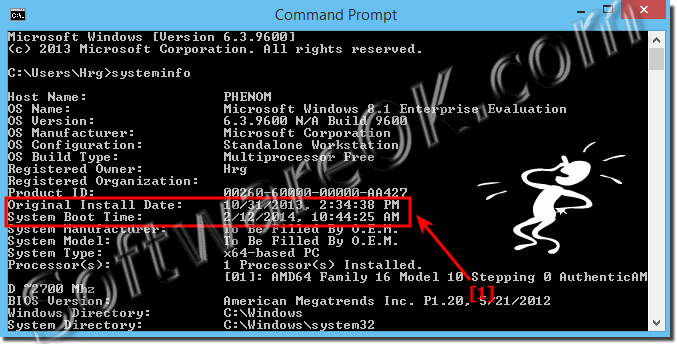 How to check uptime in Windows 8.1 and 10? Window 8.1 64 bit task manager? Lastbootuptime Windows 8.1 or Windows 10? Running since the last reboot od my Windows 8.1 or Windows 10? How long has windows 8.1 been out or windows 8 computer running since to track how long computer running software? How long has windows 8.1 been out? How long has windows 8 been out? How to tell how long a computer has been up windows 8.1 or Windows 10? How to see running timer in windows 8.1 or Windows 10? Command to know how long the computer has been running on windows server 2003? What's a fast way to find out how long my Windows system has been running? Can I find out how long I've been running my computer since I last boot of Windows? How to know how long my Windows 8.1 computer has been running? How long Windows 8.1 computer or server has been running? Measuring Windows 8.1 uptime, How long's? How long's it been since last rebooted Windows 8.1? How long since my w8 pc booted? Pc running times, how to find how long the the computer been running for windows 8.1 or Windows 10? How to find runtime of pc in windows 8.1? Computer running time win 8.1 or Windows 10? How to know how long your pc has been running windows 8.1 or Windows 10? How to find out how long your computer has been on w 8.1 or Windows 10? Windows 8.1 uptime, how long has win 8.1 been out? How long since my computer's been on? Win 8.1 check how long system been running? How to see for how much time the pc has been on in Windows 8.1 or Windows 10? How long the computer was on in windows 8.1 or Windows 10? How long has my pc been on check in windows 8? Find how long a server has been up 2012? Command for checking how long windows pc is running? How to check how much time pc running in windows 10?